Alright folks, the winter storm of the year will be one to remember for many, over 100+ million people for that matter. The actual storm is starting to get its act together on the eastern range of the Rockies and it poised to cross the Midwest Sunday and eastern seaboard Monday. It has plenty of strengthening to do in the next 24 hours, but all indications and dynamics suggest that the models are dead on with this system and its formation. 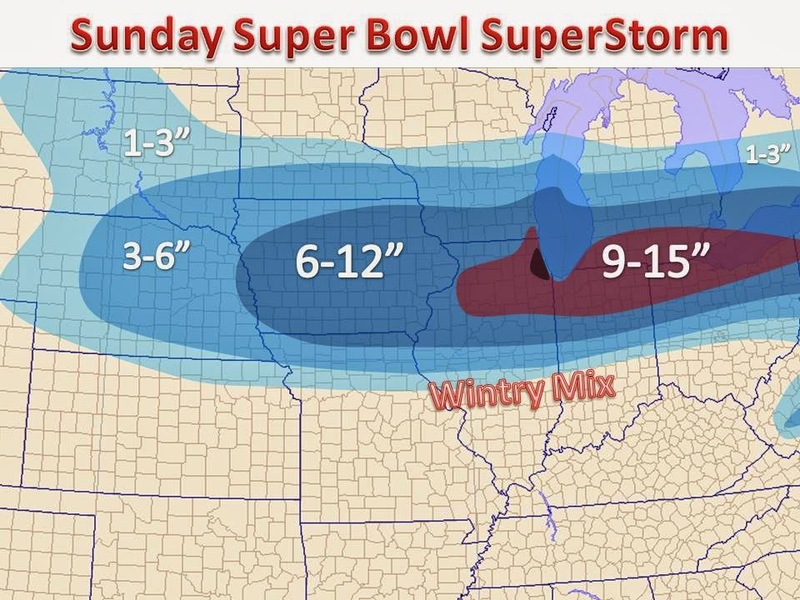 With that is mind, confidence is substantial that a high impact, travel crippling winter storm will strike the most populous areas of the Midwest Super Bowl Sunday. Switching gears, it has been a topic in weather communication and in the weather community to not "hype" storms as many media outlets do, but this storm certainly deserves such praise. It is not often that we can say with near certainty that "numerous locations will see a foot of snow by Sunday evening," but that is the case. A wide band of over 6" will set up from Iowa all the way through the major metropolitan cities on the eastern seaboard. Amounts of 10",11", 12" will embed themselves within the band. The national media attention will certainly be focused on New York to Boston, but this looks to be a Chicago special here in the Midwest. It is storms like this and tracks like this where Chicago can capitalize on the heaviest snow amounts. With counterclockwise winds around the center of the storm, Chicago will be in a position to see its snow enhanced by Lake Michigan moisture. As we posted on Our Facebook Page a couple days ago, the lake is only 21% frozen and is all open water off the shore of Chicago. With temperatures near 20 and water temps in the upper 30s, lapse rates will become unstable and convective thundersnow is possible in northeast Illinois. There will be a long enough fetch across the open waters of Lake Michigan, as the winds shift to a more northeasterly direction as the low passes through central Indiana. The NWS is somewhat downplaying the lake enhancement, but amounts of 16"-20" are more than possible in isolated bands. Officially we are going to call for 10-16" in the Chicagoland, with higher amounts possible where banding sets up. This storm has a lot to offer and will be one of the major news stories as the clean up begins Monday, second to that of the Super Bowl! Be sure to take it easy Sunday, enjoy the game, and keep it here to Midwest Weather!